9m (29.5ft) width x 6m (19.7ft) length & 2.4m (7.9ft) to eaves. 1) Made from cold rolled Cee-section columns and rafters. 2) All framework is hot dipped galvanised steel to BS EN 10147 Fe E350G-Z275. 3) Single Skin Box Profile Cladding, Vandyke Brown and White Plastisol Coated, Steel Sheeting. 4) Anti-Condensation Barrier coating on roof. 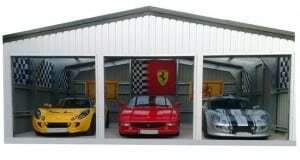 5) 3 x Plastisol Coated Domestic Roller Doors 2.3m width x 2.1m high. 6) All plastisol coated guttering and down-pipes and necessary screws, bolt sets, masonry anchors, screw caps and brackets required to erect this building are included. 7) Steel Building kit Delivered to Mainland UK address. All steel buildings are engineered to suit the exact specification and erection location therefore prices may vary slightly from this example.